The full drum sheet music for “Simple Man” by Lynryd Skynryd from the album Skin-‘nerd (1973). 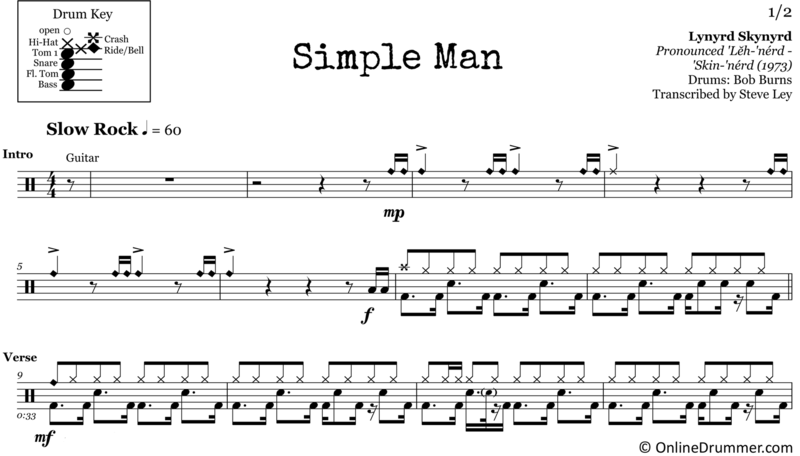 “Simple Man” — It’s one of those songs every drummer should learn to play. A crowd-pleaser that transcends generations. Bob Burns plays a drum part with an overall simple, laid-back feel but intersprinkles choice, pocket embellishments throughout and timely explosive drum fills to make this piece a classic. The full drum sheet music for "Sweet Home Alabama" by Lynyrd Skynryd from the album Second Helping (1974).